Since news of the study broke, a lot of excellent commentary has already been published about it and the way much mainstream media chose to spin it. So rather than sound like a broken record, here’s a sample of key points, followed by an article I received via email from the Cornucopia Institute. In reality,…the study in some places makes a strong case for organic — though you’d barely know it from the language the authors use. And in places where it finds organic wanting, key information gets left out. 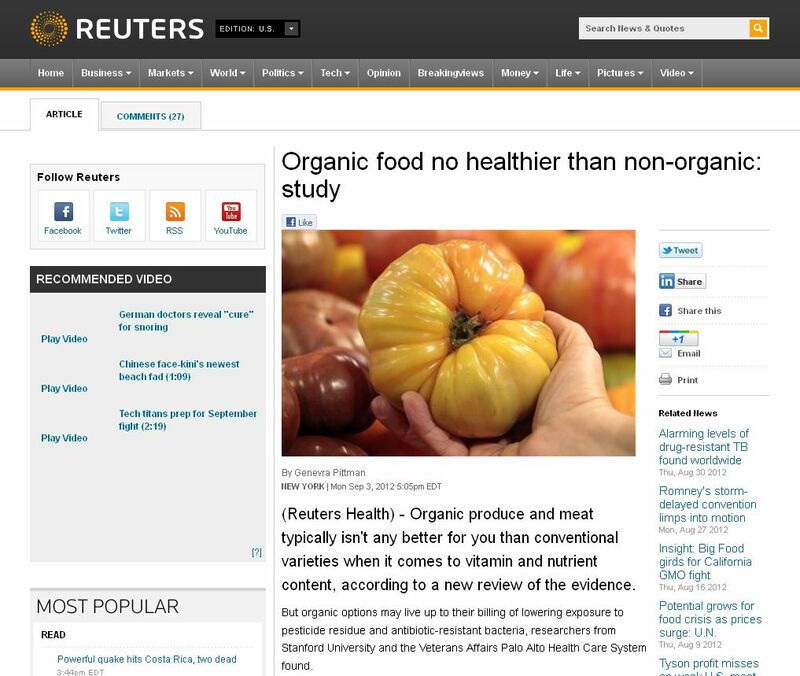 To assess the state of science on organic food and its health benefits, the authors performed what’s known among academics as a “meta-analysis”—they gathered all the research papers they could find on the topic dating back decades, eliminated ones that didn’t meet their criteria for scientific rigor, and summarized the results. I think we’re kind of erecting a straw man and then knocking it down, the straw man being that the whole point of organic food is that it’s more nutritious. The whole point of organic food is that it’s more environmentally sustainable. That’s the stronger and easier case to make. It depends on your values. If you’re concerned about nutritional value and taste, you might find that the local food, which is more likely to have been picked when it was ripe, is better. Because any food that’s traveled a few days to get to you or been refrigerated for a long time is going to have diminished nutritional value. That argues for fresh being more important than organic.